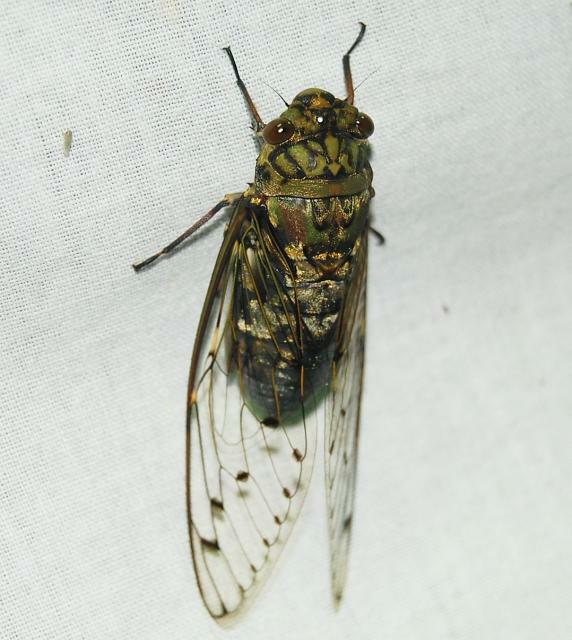 Pomponia linearis is a cicada found in India. Pomponia linearis is currently considered to contain several species (complex), for example, the population of Taiwan and Japan has been changed to Pomponia yayeyamana. See Duffels and Hayashi (2006) Tijd. Entomol., 149, 189-201. Head, pronotum, and mesonotum are greenish-ochraceous. Head with the anterior margins of the front, an irregular central fascia to vertex enclosing the ocelli, a large spot on the inner side of eyes, and the anterior lateral angle of vertex, dark olivaceous. Pronotum with a broad central longitudinal fascia, two large oblique spots on each lateral area, and a spot on the lateral margin, brownish-olivaceous. Mesonotum with seven brownish-olivaceous spots; situate two central and obconical, between which is an arrow-shaped discal spot, a small spot on each side of the two central ones, and a long spot on each lateral area, two small spots of the same color in front of each anterior angle of the basal cruciform elevation. Abdomen pale castaneous with ochraceous pilosity. Head beneath, sternum, legs, and opercula pale greenish ; upper and apical areas of face, a spot between face and eyes, posterior margins of eyes, anterior tibiae, apices of intermediate tibiae, a spot near apices of femora, apices of anterior and intermediate tarsi, apex of rostrum, and a triangular spot between the intermediate and posterior coxae, dark fuscous. Abdomen beneath dark ochraceous. Tegmina and wings pale hyaline ; tegmina with the costal membrane greenish, transverse veins at the bases of the second, third, fourth, fifth, seventh and eighth apical areas infuscated, and a marginal series of small fuscous spots situate at the apices of the longitudinal veins to apical areas; the venation is otherwise ochraceous, sometimes replaced by black; basal cell and claval margin brownish-ochraceous. Wings with the venation brownish-ochraceous; claval margin darker in hue. 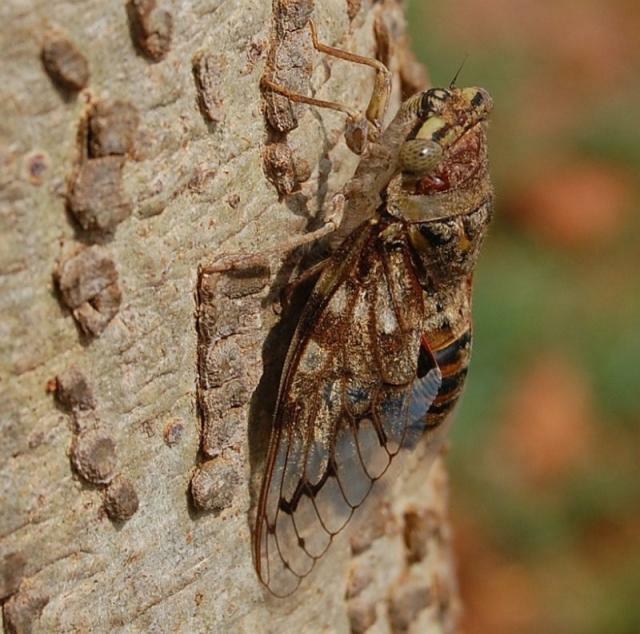 Here’s a cicada I never thought I would see, but thanks to Raghu Ananth, here are two photos of a Tosena sibyla Gaeana atkinsoni. Note the characteristic double stripes on the forewings. Note how the smaller stripe doesn’t make it all the way to the claval fold. 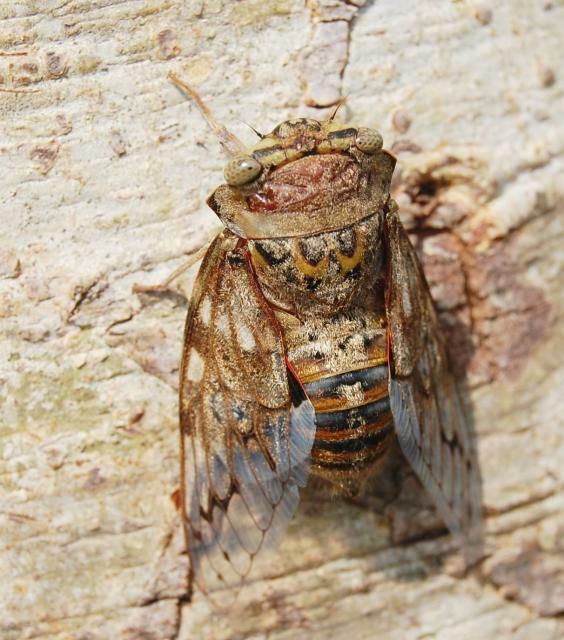 The cicada has red eyes, red thorax with black patch above, red abdomen, black wings with yellow veins and a large yellow patch lines on the wings. Numbers. found – several dozens. 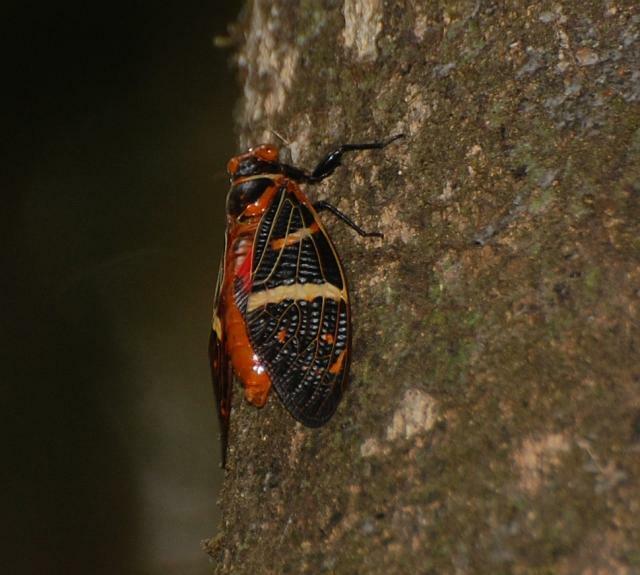 The orange-red coloured cicada is one of the beautiful cicadas in the forests. 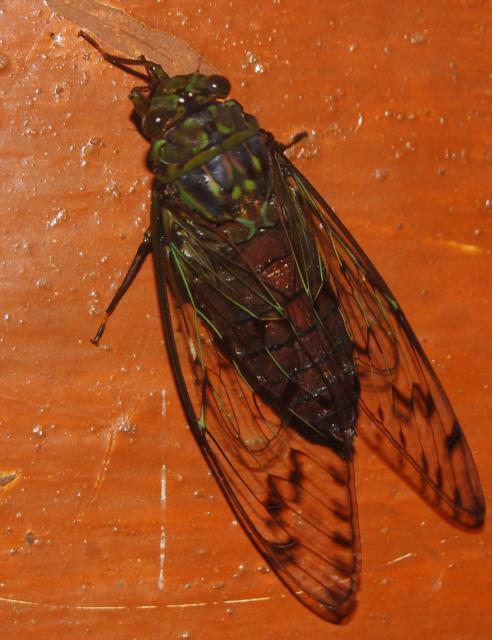 It has a red body, red eyes and black wings with yellow patches. During one of our trips to the evergreen forests in the Uttara Kannada district (Karnataka), we spotted two of them camouflaged on the bark of each tree, actively walking up and down and then appearing a colourful red when in flight from one bark of the tree to another. Their singing, however, seemed not in sync with each another. On our approach, they would try to hide behind the bark or fly to a distant tree. 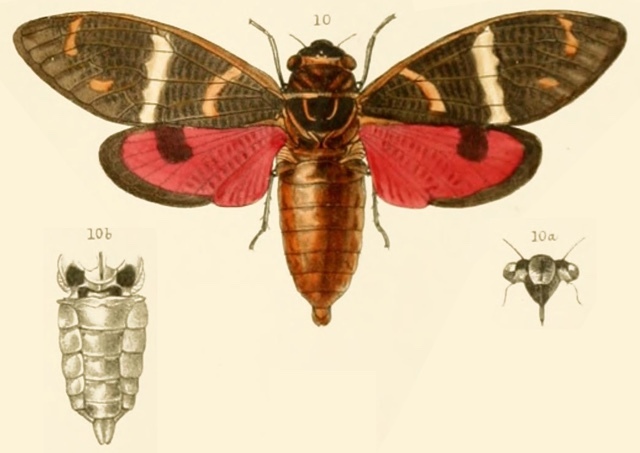 This illustration of a T. sibylla Gaeana atkinsoni comes from the document A monograph of oriental cicadidae (1892) by W. L. Distant.